2025. The cities of the Pacific Rim are under attack by Kaiju, huge creatures from another dimension which enter ours via the Breach, a portal on the floor of the Pacific Ocean. To combat this menace, humanity has built Jaegers, colossal war-mechs piloted by two people using a neural link to share the massive amounts of information flowing through the machines. Initial victories soon turn sour when larger and more powerful Kaiju start appearing, and the world's governments decide to shut down the Jaeger programme in favour of building immense coastal walls. With his resources about to run out, the commander of the Jaeger programme, Stacker Pentecost, stakes everything on a last-ditch assault on the Breach. But first he must find someone to pilot the refitted Jaeger known as Gipsy Danger. Pacific Rim is director Guillermo Del Toro's homage to Japanese films and TV series about giant robots and huge monsters (it is dedicated to Ishirō Honda, a legendary Japanese special effects artist, as well as Ray Harryhausen). It is part Transformers and part Godzilla, only better than the recent big screen incarnations of either. Like Michael Bay's Transformers films, there's a lot of giant robots in this film smashing stuff up. Unlike Michael Bay's Transformers films, the action is well-choreographed and relatively easy to follow, the stakes of events are clearly laid out and the human characters are sympathetic and well-acted. The writing is not original and there are few cliches that Del Toro does not leave unexplored in the film. The leading expert on Kaiju biology is a befuddled English scientist with glasses and a tweed jacket (and played by Torchwood's Burn Gorman), whilst Idris Elba's Stacker Pentecost (best movie character name ever?) gives inspiring speeches and is authoritative and stern but with a human side to him. Few plot twists can't be seen coming from a mile away, but somehow none of it matters. Del Toro is having a huge amount of fun here and, unlike the ridiculously-over-convoluted plots of the Transformers films, knows it's best to keep things straightforward and simple. That said, he does throw a few different spins on things. The Jaeger programme is refreshingly multi-ethnic, with Stacker being British, sort-of hero Raleigh Beckett (Charlie Hunnam) being American and co-lead Mako Mori (Rinko Kikuchi) being Japanese. The other predominantly-featured Jaeger pilots are Australian, Russian and Chinese, and most of the film is set in and around Hong Kong. The casting, the characters, the setting and the film's name suggest this movie is being made with the Asian markets partially in mind, and it'll be interesting to see how it performs when it opens in those markets (it's European and American box office performance has been solid but unspectacular). The ethnic mix is refreshing, but the gender ratio is more bemusing: Kikuchi's Mako is the only female character of note in the entire movie. The female Russian Jaeger pilot gets maybe two lines (though also one of the film's funniest moments, when she and her Russian co-pilot very calmly walk away from a dangerous situation when everyone else panics) and that's about it. True, Mako kicks an enormous amount of Kaiju backside, is a complex character with a well-developed arc and is probably the second best-acted role in the film (after Elba's excellent turn as Pentecost), but it's a bit odd when there seven male characters of note in the film and only one female. Overlooking that (and hoping it will be rectified in the unconfirmed sequel), Pacific Rim does a lot with its ingredients. 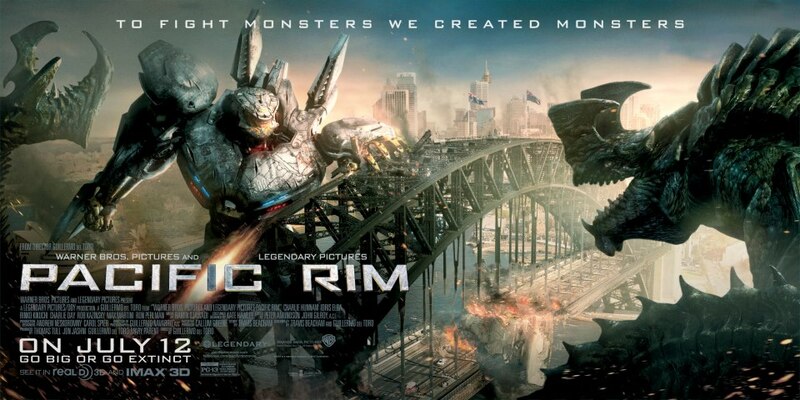 The action is genuinely impressive, with the Kaiju/Jaeger fights having a weight and heft missing from similar movies, and the characterisation and drama is no great shakes, but done well enough to keep things moving along. For such an effects-drenched movie, it has a surprising amount of heart and charm (or surprising until you remember it's still a a Del Toro flick), and overcomes some logic flaws with raw enthusiasm. In that sense it feels close to the original Star Wars: an effects-laden movie built around ultimately likable (although unoriginal) protagonists. Pacific Rim (****½) is an outrageous amount of fun, featuring genuinely impressive effects, astonishing production design and attention to detail but, more importantly, interesting (if archetypal) human characters and a nice line in humour. It even has flashes of intelligence in how it's visually constructed and the worldbuilding behind the film (though with allowances for the premise). As far as huge blockbusters go, this is one of the most satisfying of the last few years. Excellent! Really looking forward to seeing this! Exactly Wert, a total heap of fun. Done with love, skill and flair. I was 12 years old again and during The Battle of Hong Kong bay I smiled like I haven't smiled since my son's birth! GDT is a treasure, an sci-fi/horror/fantasy auteur. Imagine what he could do with At the Mountains of Madness? This was a ton of fun, I saw it in in IMAX 3d, don't think the 3D added anything (as usual) but IMAX was a definite plus and the sound was unreal. del Toro has freely admitted there are certain elements of kaiju flicks that are frankly expected and he does hit all of those I believe. What sets it apart for me, is that the world it's set in doesn't get destroyed, it's already been at least partially destroyed, and it looks lived in, there isn't the gleaming sleek fascist look to the jaegers, they look used and lived in. Pacific Rim is an excellent movie...when the action starts! The rest of the time it was total nonsense. If only Del Toro didn't try to put in the stupid love story and crazy sci-fi mind rift nonsense. What a movie it would have been then! There wasn't a love story in the movie though. There's hints that Mako and Raleigh might be headed in that direction, but they never get together and the hints take up about 30 seconds of the film. Actually, I'd argue the "crazy sci-fi mind rift nonsense" (which was the most interesting thing about the film) WAS the love story. Being "drift compatible" seems to basically mean you love each other--the Jaeger pilots are all either family members or romantically involved (the Russians were husband and wife). Which of course provides a nice payoff with the two bickering scientists. Oh, there was a love story in there. It was just a terribly done one. Remember the final scene when Mako swam to the pod of Raleigh; the cring-worthy sparring between the two; the talk between the two on the platform after their first rift. Come on people, I like the film but let's be honest; Del Toro made a lot of mistakes in this one.